Jay Som photograpped by Cara Robbins. Melina Duterte has had quite a year. 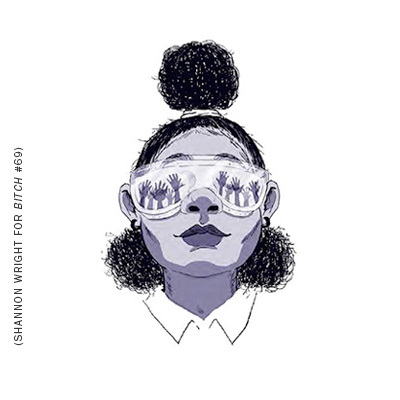 Last fall, the Bay Area musician, who performs under the name Jay Som, released an album online for her small but eager following. Duterte unveiled the album, called Turn Into, on a bit of a whim; she says the songs were all “finished and unfinished.” But Turn Into caught people’s attention, and since then, it’s been a whirlwind: she signed to Polyvinyl, a beloved indie label, played shows all over the country, and started recording her next album. 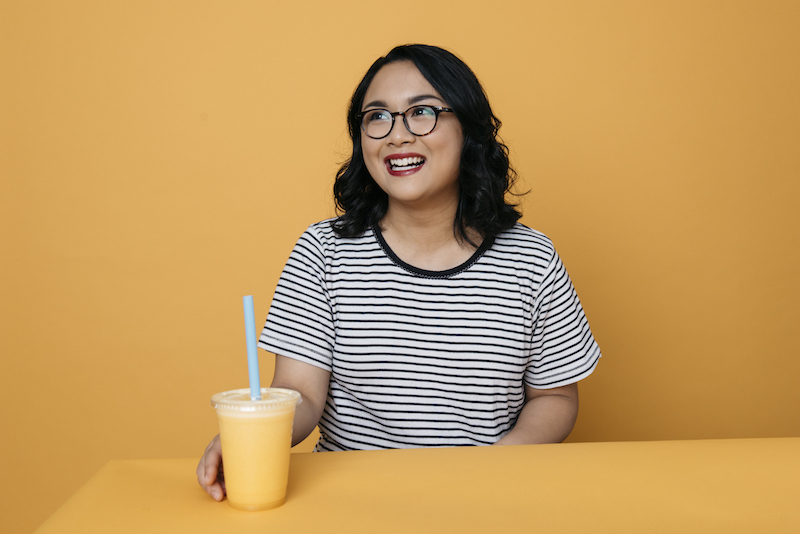 A nationwide tour this summer brought Jay Som’s dreamy, fierce alt-rock to the masses, as she was the opening act for rising stars Mitski and Japanese Breakfast. (It’s worth noting, too, that this was a tour made exclusively of projects fronted by Asian-American women. Duterte, who is Filipino American, says the experience was “very special.”) Before the tour, Duterte had been performing locally for a few years, having self-released some demos. While most of these recordings include layers of drums, bass, and guitar—all played and produced by Duterte—the summer tour found her performing solo with just an electric guitar. As a result, the stunning intimacy and carefully crafted melodies of Jay Som’s music were on full display, the same hallmarks of expert songwriting that presumably prompted Polyvinyl to sign her. Polyvinyl will be rereleasing Turn Into in November and will release Jay Som’s next record in 2017. Ahead of Turn Into’s rerelease, Duterte and I chatted about her dual roles as writer and producer, her experience touring with Mitski and Japanese Breakfast, and the songwriting process for her next album. MARISSA LORUSSO: I heard that there was a funny story about the original release of Turn Into, when you put it on Bandcamp. Could you tell me that story? I know that you’re a multi-instrumentalist. What instruments do you play? Which ones do you feel the most comfortable on? What do I play? I mostly play guitar, I do play bass, I play the synths, I’m playing the drums now—I think I’m getting a little better. I’m practicing a lot! [Laughs.] Did I say piano? I feel like I said piano. And I just picked up the trumpet again after stopping for three years. I played trumpet for years when I was younger, too—all the way up until high school. I love playing the bass. The bass guitar is my favorite instrument to play. On the album that I’m working on, I’ve got some weird instruments that weren’t on the previous album. What kind of weird instruments? Well, I’ve got the trumpet on there. I’ve also got accordion. And just different, weird instruments. I’m going to use my old recorder—you know those handheld recorders from school that people had? Yeah. I haven’t found a way to use it yet, but I’m going to use it! And you did all the production on Turn Into as well, right? I feel that’s something that gets missed in larger conversations about indie artists who record at home and put things on sites like Bandcamp: There’s this whole other, technical side of it in terms of producing and recording. And it doesn’t get talked about as much, in terms of being a skill set. Do you feel like producing is as much part of your skill set, or part of your identity as a musician, as playing the bass and singing and songwriting? Oh yes, it completely is. I’d say that’s a huge priority for me as a musician: my skill set as a producer or audio engineer. I mean, I wouldn’t call myself a professional audio engineer, but I definitely work on that craft. I feel like I am very dedicated to tone and different textures in audio, and I’m really fascinated by that. I’m as fascinated with it as I am with songwriting and playing music itself. And it is frustrating, too, when you hear about these female-identified musicians who do everything themselves, and then people automatically think there’s a band behind it. They’re like, “Who’s the guy who produced your stuff?” And sometimes it’s strange, because you feel like you have to work 10 times harder to be taken seriously as a female producer. So are you going to continue to be in charge of the recording and producing on the stuff that you’re doing going forward? For this next record, are you mixing it yourself? Yeah, 100 percent yes. Especially for Jay Som, before I was signed to a label, I always told myself that this was how I wanted it to be: I always wanted it to be my own, bedroom-produced kind of thing. And when I signed to Polyvinyl, they totally understand that; they trust me as well. And moving forward with this new album, it’s the same thing. It’s all me. I just personally don’t see myself in a music studio. I’ve had some experiences with that, but it’s just not for me, for this music that I’m making. I also wanted to ask about the tour that you were on this summer with Mitski and Japanese Breakfast. How was that? The fact that it was a tour where all three acts were led by Asian-American women was pretty unique, I think! I don’t know if that was something that you all talked about. Oh yeah, we definitely talked about that a lot. The tour was phenomenal; I still can’t believe it, even now. It’s been a few months and I cannot believe that I was a part of that. That as my first national tour was everything I dreamed of. Oh wow! I didn’t realize that was your first national tour. Yeah, it was my first. It was 38 days, 27 shows—and most of them were sold out! And I learned so much from Japanese Breakfast and Mitski and our tour manager. And we did talk about that, often, about how unique it was that our lineup consisted of Asian-American women. I had never seen that, ever. If I saw that bill when I was 13, I’d probably freak out. I think after the first show, it really hit, because we kind of like looked at the audience, and there were so many young women and young women of color. So it was very special. Did your process of songwriting change between writing the first album and writing this one? How did it feel when these demos that you released just for fun all of a sudden started getting all of this attention? It seems like you didn’t quite think that as many people would end up hearing these songs as have heard them. Yeah, I was pretty damn surprised. At first I didn’t get it. Because when it came out, for the first month, the people who were already listening to my music since 2011 were into it. And then it started growing locally, where friends-of-friends were passing it to each other. I would see it on social media all the time, and people would come up to me in the city and just talk about the album. And that was fine. And then it started getting weirder when I started getting managed. That was where everything started to get into place. But I’m still really bad with attention; I don’t know how to handle it. I was on your Bandcamp earlier, and I saw that someone left a comment that says something like, “This is my soundtrack for when I’m falling in love.” What an honor! I know! I love when people say that stuff to me. That’s wonderful. They’re like, “Oh this is me and my partner’s song.” That’s the weirdest thing to hear. It’s great, though. You’re the soundtrack to someone’s young, budding romance! Marissa Lorusso is a Washington, D.C.-based writer, researcher, zine-maker, musician + gender studies nerd. A new 700-page collection from Fantagraphics puts female comix artists where they belong: in the history books.